The Lippert-Astograph originally consisted of three separate telescopes on a single mount. 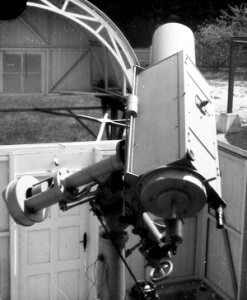 There was a ZEISS double-astrograph with 1.5 m focal length and 30 cm aperture mounted on one side. 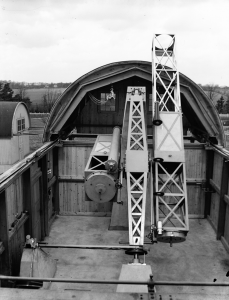 On the opposite side, a telescope was mounted that had dimensions as proposed by the Cart-du-ciel project, with 3.4 m focal length and 34 cm aperture. Additionally, there were two guiding telescopes. The instrument was endowed by Eduard Lippert (1844-1925) whom Richard Schorr (1867-1951) could convince to set it up at the observatory rather than at his private observatory. 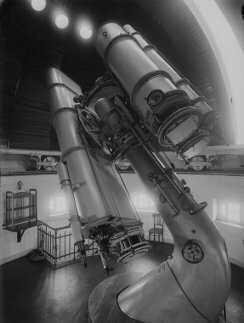 The Carte-du-ciel telescope was a three lenses telescope (named Triplet L), the ZEISS double-astrograph was a three lenses (Triplet K) plus a 4 lenses telescope (Petzval P). The photo plates where named accordingly with the plate number and the additional identifier (K, P, L). The maximum plate dimensions were 24cm x 24cm for the L and 30cm x 30cm for K and P telescopes but there were other formats such as 09×12, 13×18, 24×24, 24×30, and 30×30. The resolution is 1.44 arcsec/pixel. The instrument was used mainly by Arnold Schwassmann (1870-1964) and Artur Arno Wachmann (1902-1990) who discovered a high number of comets and asteroids with it. Both did the painstaking work for the Bergedorfer Spektraldurchmusterung with 160 000 examined stars. The total amount taken with this instrument are 9233 photo plates from which 8752 are still in the plate-archives. All plates are already digitized and freely available at http://plate-archive.hs.uni-hamburg.de. The 1m telescope was built by ZEISS and with its special mounting it was one of the most unusual telescopes. For a short time it was the 4th largest telescope in the world, until 1920 the largest telescope in Germany and the ZEISS’ first effort to build a large telescope. Though its weight was 26 tons it could be moved easily by hands due to the cleverly devised mounting. Only three telescopes of this type were ever built. With 3m focal length and a Newton-focus it was extremely bright. On the other hand, it showed a large comatic aberration but despite that, fields up to 2° x 2° which have been explored successfully. The resolution of today’s corresponding scans is 0.74 arcsec/pixel. Until 1920 it was used mainly by Richard Schorr and contributed to the discovery of 30 minor planets and a new comet. Later, Walter Baade (1893-1960) continued and the research moved from the traditional astronomy to astrophysical questions. His work on variables in globular clusters was pioneering. In 1931 he left Hamburg and moved to Mt. Wilson Observatory. 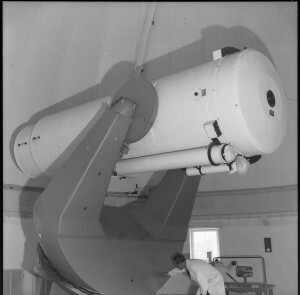 A prism spectrograph was added to the telescope (see left hand image) with which about 2700 spectra have been observed between 1947 and 1975 from which 1787 plates are already digitized. The Großer Refraktor, with its 60cm aperture and 9m focal length, is one of the largest refractors in Germany. It was first delivered with a visual objective built by Steinheil, while the mounting was constructed by Repsold & Söhne, with the the dome and the large lifting ramp (13m) being built by ZEISS. In 1925 a second exchangeable objective was added which was optimized for photographic purposes. This objective was improved by Bernhard Schmidt in 1931 to serve better the new available emulsions. First it was used for visual observations and visual photometry, and later for photographic photometry. These plates were stored in the cellar of the building and due to the bad storages conditions many of them show mold on the emulsion. The photo plate sizes range from 9cm x 12cm to 24cm x 24cm. The resolution of modern scans is 0.24 arcsec/pixel. Nevertheless, 2250 of about 2500 plates still available from this instrument have already been made available digitally. This AG-Astrograph was one of three built, and used in the 1930’s to produce a catalog of about 200 000 accurate stellar positions. The preceding AGK-catalog, already initiated in 1860, with about 100 000 stellar positions was expanded into the AGK2-catalog beginning in 1929. It should have been a cooperation of three observatories, namely Hamburg, Bonn and Pulkowa. Despite the fact that the Hamburg contribution already exceeded 50% of the task, observations were running so well that over the course of only 8 months the additional 173 photo plates assigned originally to Pulkowa had already been taken at Hamburg. The photo plate size is 24cm x 24cm and the resolution of the scans 1.06 arcsec/pixel. All of the 4281 plates are already available digitally. The Schmidt’sches komafreies Spiegelteleskop was an invention by Bernhard Schmidt (1879-1935), an ingenious optician working at the Hamburger Sternwarte as a freelancer. He tried successfully to overcome the bad image quality of a parabolic mirror caused by comatic aberration by polishing a correction plate, which corrects the light path to a spherical mirror. His instrument gave point like images all over the films despite the spherical curvature of the original focal plane. Today many large telescopes across the world, whether ground-based or aboard satellites, as well as cameras objectives are built using his principles. The plate size for the original Schmidt-Telescope is 9cm x 12cm, while the films are circular with 9cm diameter. The resolution of the scans 3.55 arcsec/pixel. 1706 plates and films taken with this first Schmidt-telescope are completely digitized and are available. About 1000 films and plates were taken between 1954 and 1960, partly in Asiago/Italy where it was used since October 1955. Finally, in 1954 the Großer Schmidtspiegel was ready, though it had been requested as early as 1937 by Walter Baade. Its dimensions are 80 cm aperture and a mirror size of 120 cm diameter. It turned out to be too late for setting up such a telescope at the observatory because of the light pollution from the encroaching city. Additionally, the weather conditions were deemed too limiting for the excellent optics and a new site was looked for. In 1975 the telescope shut down and was moved to the Calar Alto/Spain where it could prove its optical quality. Since then it was called Hamburger Schmidtspiegel. Nevertheless, 5769 plates had been taken at Bergedorf. The plate size is 24cm x 24cm and the resolution of the scans yields 0.91 arcsec/pixel. As Hamburger Schmidtspiegel it was used in the first survey that was designed to be digitized, namely the Hamburg Quasar Survey. The extragalactic survey started in 1984 and 1922 plates were exposed for this project until 1998. A total of 3300 plates were taken at Calar Alto Observatory. Altogether about 9000 plates are already digitized and freely available. 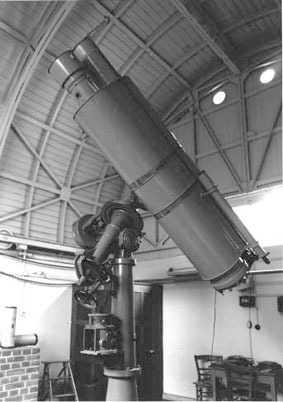 The Dual-Reflector Telescope was finished by Bernhard Schmidt in 1934 and was used until 1957. It was a combination of Schmidt-telescope and parabolic mirror telescope on one mount, both with same aperture (0.60 m) and focal length (3 m). 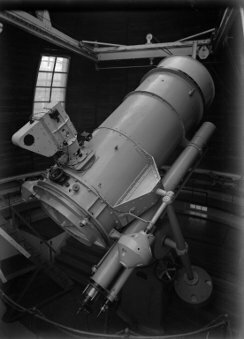 Obviously it was designed to compare both types of telescopes, though, the Schmidt-telescope was only used randomly probably due to fogging problems of the correction plate and the wind sensitivity due to the double length of the telescope. More than 2000 plates were taken with both telescopes from which 1366 DRP-plates exposed with the parabolic mirror telescope and 265 DRK plates exposed with the Schmidt-telescope still exist. Since 1960 the 60 cm parabolic mirror is used in the remaining Lippert-Astrograph telescope where it replaced the Carte-du-ciel telescope. There was a copy of the first Schmidt-camera which was called Small Schmidt-mirror II (or Salvador-Schmidt because it was intended to be used in San Salvador/El Salvador). It was built with the second correction plate which Bernhard Schmidt had produced. The first one was used in his original Schmidt-Camera. First tests were done in 1952 by Stock (plates KSP0001-33). 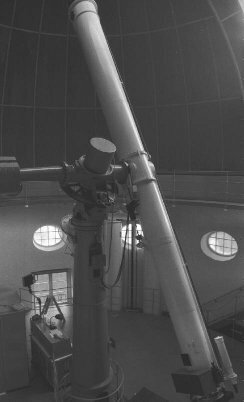 While the telescope was used at Hamburg Observatory from 1954 until 1960 518 exposures were taken on circular films or glass plates. 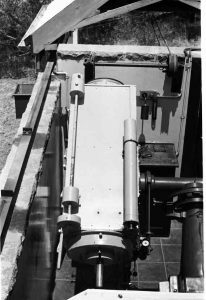 From 1962 until 1968 this telescope was moved to Boyden Observatory in South Africa (the plate-images are named KSB standing for ‘Kleiner Schmidt-Spiegel Boyden’ instead of ‘HS’ on the plate envelopes). More than 2300 films were exposed at Boyden Observatory, from which 257 were returned to Hamburger Sternwarte. In 1970 the telescope came back to Hamburg again and about 325 films still exist which were exposed between 1970 and 1976.